XLY - Consumer Discretionary Select Sector SPDR Fund – Shares in the Consumer Discretionary Select Sector SPDR Fund are trading 0.60% lower today at $59.20 as of 12:15 p.m., slipping slightly from an all-time high of $59.90 reached yesterday. A large print in XLY put options during the first hour of the trading session indicates one big player is bracing for the price of the underlying to potentially decline substantially during the next couple of months. It looks like the strategist purchased a block of 31,500 of the Sep $55 strike puts at a premium of $0.41 per contract. The position may be an outright bearish bet on consumer discretionary stocks or may be a hedge to protect the value of a long position in the underlying fund. The bearish trade makes money at expiration if shares in the XLY decline 7.8% from the current price of $59.20 to trade below the breakeven point at $54.59. The XLY last traded below $54.59 at the end of June. All told, upwards of 39,000 of the Sep $55 strike puts changed hands by midday versus open interest of 5,568 contracts. XLY - Consumer Discretionary Select Sector SPDR Fund – Bears are hoarding put options on the Consumer Discretionary SPDR Fund following the release of dismal employment figures ahead of the open this morning. We noted growing interest in XLY puts on Tuesday and Wednesday of this week, which suggested traders were hungry for varying degrees of protective or bearish positions on the sector. Shares in the XLY, an exchange-traded fund that tracks the performance of the Consumer Discretionary Select Sector of the S&P 500 Index, are down 1.9% in early-afternoon trade to stand at $36.42. The fund’s shares have fallen roughly 13.0% since hitting a 52-week high of $41.78 in the first full trading week of July. The sizable positions initiated in XLY puts earlier in the week, pale in comparison to the large bearish prints in the options today. It looks like one or more investors purchased some 34,750 puts at the October $30 strike for an average premium of $0.41 apiece. Put buyers profit if shares in the XLY plunge 18.75% from the current price of $36.42 to breach the average breakeven point on the downside at $29.59 by expiration day next month. Much of the 17,564 puts represented in open interest at the October $30 strike were purchased Tuesday for an average premium of $0.36 each. Traders long the put options may see the value of their positions appreciate if the price of the underlying fund continues to push lower in the next seven weeks to October expiration day. T - AT&T, Inc. – The cost of buying AT&T put options that expire at the end of the week exploded after the U.S. Justice Department filed suit to block the telecommunications company’s proposed $39 billion acquisition of Deutsche Telekom’s T-Mobile USA, Inc., on grounds the deal would hamper competition in the wireless market. Shares in Dallas, Texas-based AT&T fell as much as 5.5% on the news to $28.00, while options implied volatility jumped 30.0% to 27.97%. Frenzied options trading ensued on AT&T during a news conference held to explain the lawsuit. Nearly 200,000 option contracts have changed hands on the stock as of 1:25 pm in New York. Put options are more active, with around 1.5 puts trading on AT&T for each single call option in play this afternoon. CLGX - CoreLogic, Inc. – Options volume on the provider of business support services has ballooned to more than twice the number of existing positions on the stock, with calls changing hands more than 20 times for each single put option in action. The spike in demand for calls is no surprise given the 28.6% rally in CoreLogic’s shares to $11.30 today, on news the company hired Greenhill & Co. to help it consider various options that could include putting itself up for sale. Increased activity in CLGX options sent implied volatility on the stock screaming higher to 66.48%, a 79.3% gain over yesterday’s close. Much of the nearer-term positioning in CoreLogic call options today appears to be the work of bullish investors expecting the price of the underlying to continue higher. But, open interest patterns in the calls suggest not all players acted after news of Greenhill & Co.’s hire hit the stands. It looks like some traders picked up 445 of the October $10 and 550 of the Jan. 2012 $10 strike call options yesterday for an average premium of $0.14 and $0.40 apiece, respectively. The values of these positions no doubt exploded overnight, with buyers of these options now paying around $1.53 and $1.64 for the right to purchase shares in CLGX at $10.00 come expiration day in October and January 2012. Although overnight success stories such as these tend to raise an eyebrow or two, there is no evidence as yet to indicate call buyers knew what was coming to them today. COF – Capital One Financial Corp. – Better-than-expected fourth-quarter earnings of $0.83 per share, which blew straight past average analyst estimates of $0.45 a share, failed to shield the stock from the massive beating received during the trading session. Shares plummeted 11% to an intraday low of $38.18 after analysts at FBR Capital Markets slashed their forecast for COF’s earnings. FBR analysts cited “shrinking margins and new U.S. credit-card regulations” as reasons for the reducing earnings estimates according to one Bloomberg article released this morning. Bearish option traders are out in full force, populating both the call and put sides of the stock with pessimistic transactions. Investors purchased put options as low as the February $35 strike where 1,200 contracts were picked up for an average premium of $0.57 apiece. Traders long the puts are perhaps bracing for an additional 9.80% shift down in the price of the underlying to the breakeven point on the puts at $34.43 by expiration next month. Approximately 2,000 nearly in-the-money puts were purchased at the higher February $38 strike price at an average premium of $1.46 apiece. Call selling added to the bearish picture as some 2,100 contracts were shed at the out-of-the-money February $40 strike for a premium of $1.43 per contract. Finally, one trader initiated a pessimistic stance in the January 2012 contract. Perhaps this investor believes today’s turmoil is just the beginning of Capital One’s troubles, or, alternatively, the trader may simply be looking to keep the dollar credit on the following transaction. The trader purchased 1,500 puts at the January 2012 $30 strike for a premium of $4.36 each, spread against the sale of 3,000 puts at the lower January 2012 $25 strike for which he received $2.68 apiece. The investor pockets a net credit of $1.00 per contract on the spread, which he keeps if shares settle above $30.00 by expiration. Friday – Is Anybody Working For the Weekend? 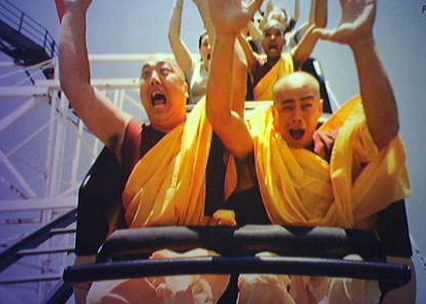 Just like any good roller coaster, market plunges can be fun when you are strapped in safely and prepared for them. Our members have been so prepared we’ll have to hand our Eagle Scout badges (we don’t need no stinkin’ badges) for riding out a toppy market for two tedious weeks, which I won’t rehash here but you can go back to my Sept 19th "Wrong Way Weekly Wrap-Up" to see how hard it was to stay bearish in the face of all that "great" news that the media kept throwing at us. Nonetheless, had you followed our trading ideas in that post, you’d be a VERY happy camper right now! Now we are down 300 points from that Friday’s finish, about halfway to our 9,100 target, which is the top 5% of our original trading range around Dow 8,650. We’d love to see 9,100 hold, especially on a nice volume sell-off so we can move our range up 5% and make 9,100 our new mid-point, putting the 33% (off the top) lines withing striking distance of a proper breakout but suddenly the news-flow has turned sharply negative. This is something I warned members about way back on August 11th, the last time I thought we were getting toppy (and we were) at Dow 9,400 when I said: "Watch the newsflow in the MSM. If it starts to get negative, look out below." Yesterday we talked about GS’s about-face on the REIT sector and, later that day, we noted during Member chat that JPM had decided to downgrade SKS, hitting the retail sector hard in the afternoon. I called a slightly early top on Retail on 9/16, when I said to Members: "Right now all retail is being played like a huge winner, as if no segment will lose market share to another. 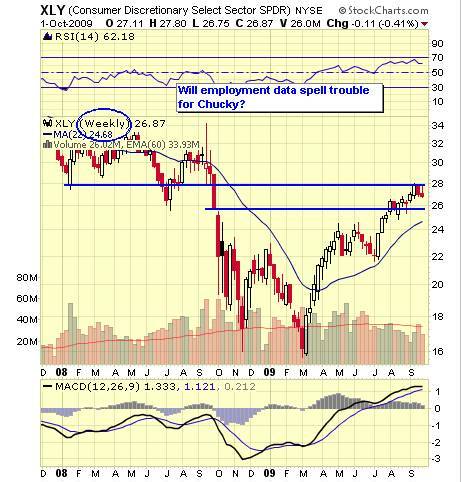 This is amazingly stupid in a declining wages and declining consumer credit environment." RTH was $88.76 that day after running up just about 20% from July 7th so we were looking for a pullback at least to $85, but I think worse as I see nothing in the data that makes me believe in Santa Clause this year or the rally he often brings. HST Host Hotels & Resorts, Inc. – The stock has shed more than 9% to stand at $7.66 on the day. One investor has positioned himself to have shares put to him by expiration in June should shares continue to decline. The sale of 13,000 puts at the June 7.5 strike price for an average premium of 73 cents apiece allows this individual to accept the premium today while bearing the risk that shares continue to decline through $7.50 by expiration. If the puts land in-the-money, he will likely have the shares put to him at an effective price of $6.77. The stock last traded at $6.76 back on January 16, 2009 after declining from its 52-week high of $18.36 nearly one year ago to the day. The investor probably figures that if the puts remain out-of-the-money he retains the premium and is happy. If the puts land in-the-money he is also happy to have shares put to him at approximately one-third the value of the 52-week high for the stock. GSI General Steel Holdings, Inc. – Shares of the operator of a number of Chinese steel companies have taken a nosedive today, losing more than 14.5% to stand at $4.72. The stock has eroded despite the fact that the firm’s adjusted earnings per share of 9 cents for the period ended March 31, 2009, beat analyst expectations which estimated loss of about a nickel per share. In line with the bearish move in the stock, one investor loaded up on downside protection in the near-term May contract. The sale of 5,000 calls at the May 5.0 strike price for a premium of 10 cents apiece was spread against the purchase of 5,000 puts at the same strike for 40 cents each. The net cost of the transaction amounts to 30 cents and yields a breakeven point to the downside at $4.70. The stock must fall by at least 2 pennies before the trader begins to experience gains on the long put position. SQNM Sequenom, Inc. – Shares of the diagnostic testing and genetics analysis company have plummeted by more than 75%, crashing through the 52-week low for the stock of $6.19, to arrive at the current price of $3.68. The catastrophic decline stems from SQNM’s announcement that the launch of its SEQureDx test for Down syndrome is now delayed due to findings that employees of the company had mishandled crucial test data supporting the product’s validity. The news of the test’s delay does nothing to help the fact that the firm’s first-quarter loss widened to 29 cents per share, and Sequenom received a number of downgrades today including a rating of ‘underperform’ from ‘market perform’ by an analyst at Oppenheimer & Co. Option investors reacted to the bearish move on the stock by picking up 1,500 protective puts at June 2.5 strike price for an average premium of 41 cents apiece. In the near-term May contract, traders shed more than 4,200 calls at the May 5.0 strike for 39 cents each. Investors who were long put options at higher strikes were able to make a killing today by selling the protection. For example, it appears that one trader originally purchased about 3,500 puts for 2.00 apiece on April 1, 2009, and today sold the lots for 6.80 each. The profits garnered on such a trade amount to 4.80 per put option sold. On the flip side, investors who appear to have held a short put position at higher strikes were faced with deep in-the-money premiums. One investor who looks to have sold 3,500 puts at the May 12.5 strike for about 1.20 apiece back on April 1, 2009, today was forced to close out the short position by paying a premium of 9.00 each for the put options. This transaction results in a loss of 7.80. Option implied volatility on the stock sky-rocketed as high as 239% up from yesterday’s reading of 91%, but has since tapered off to the current value of 195.5%. XLI Industrial Select Sector SPDR – The industrials ETF attracted massive amounts of downside protection by investors fearing a near-term contraction in shares of the fund. The price per share is currently up by 3% to $23.19 on the day following broader market gains experienced today. However, traders have enacted a decidedly bearish position on the fund in the near-term May contract. At the May 19 strike price more than 65,100 puts were purchased for an average premium of 17 cents apiece. These option contracts will begin to yield profits to the downside beginning at the breakeven share price of $18.83. Further along, the in-the-money June 23 strike price saw traders who were likely banking gains on the rise in shares today by selling approximately 27,000 calls for an average premium of 65 cents per contract. XLY Consumer Discretionary Select Sector SPDR – The consumer discretionary ETF jumped onto our ‘most active by options volume’ market scanner after investors bought a huge chunk of puts in the near-term May contract. Shares have rallied by 4% to $21.80 today, creating lesser cost premiums on put options. At the May 20 strike price approximately 58,100 puts were picked up for an average premium of 18 cents apiece. Investors have certainly appeared to brace themselves for bearish movements in the fund. Fleshing out the pessimistic picture was the sale of 2,290 calls at the May 23 strike for 82 cents which indicates that traders do not see today’s rally stemming too much further, particularly in the near-term. DELL Dell Inc. – The just-in-time manufacturer of personal computers has rallied by more than 4% to $11.35 amid broad market gains today. We observed one trader who appears to have established a covered call in the January 2010 contract. It is likely that this investor bought shares of the underlying stock today or was already long the stock previously, and then sold 24,500 calls at the January 12.5 strike price for a premium of 1.50 each. The trader pockets the 1.50 premium and has locked into gains of 10% on the rise in share price should the calls land in-the-money and the underlying stock get called from him at expiration next year. PEP PepsiCo, Inc. – The global beverage, snack, and food company’s shares have rallied by more than 1% to stand at $49.75. PEP popped onto our ‘most active by options volume’ market scanner after a large volume bullish transaction was observed in the October contract. One optimistic individual targeted the October 50 strike price and sold 30,000 puts for a premium of 4.20 apiece out of some 35,000 puts sold in total at the strike. There is no existing open interest at the October 50 strike, and thus, the trade represents short selling in anticipation that shares will rise beyond $50.00 by expiration in October. This could also represent a covered put strategy (short stock and sold puts) indicating the investor’s expectation that shares might fall further. At expiration if shares are below the strike the investor would have stock put to him at $50.00 but the premium from the puts effectively reduces that price to $45.80. XLY Consumer Discretionary Select Sector SPDR – Shares of the ETF have risen by about 0.5% to $22.60 as the ticker edged onto our ‘most active by option volume’ market scanner this afternoon due to one investor who established a ratio put spread in the June contract. It appears that this trader is looking for downside protection on the fund and so bought 12,500 puts at the June 22 strike price for 1.30 apiece spread against the sale of 25,000 puts for 65 cents at the June 20 strike price. The put spread was initiated at no cost the trader given the premium of the respective puts. If shares should decline all the way to $20.00 by expiration this individual will have reeled in the maximum profit of 2.00 possible on the trade. Profits will begin to amass to the downside at any share price below $22.00. Despite carrying a net short put position below a share price of $20.00 losses would not accrue unless shares slipped beneath $18.00, but would rise penny-for-penny thereafter.